​Wherever you’re based, there’s a good chance I can help you. I live on the North Shore, so I’ve got clients from the Waitakere districts of West Harbour, Henderson, Glendene, Glen Eden, Titirangi, New Lynn, Point Chevallier and Kingsland, as well as the North Shore suburbs of Takapuna, Milford, Campbells, Browns Bay, Albany, Glenfield, Greenhithe and Albany. I’m happy to meet you if you’re from further afield too. You may be surprised to hear that I also work with many overseas clients in Australia, Dubai, England, USA and Asia who have been referred to me by other satisfied clients. Want to Speak To Keith? Almost There - Tell us where you would like us to send your “4 Bucket System” Video. Will you be next? 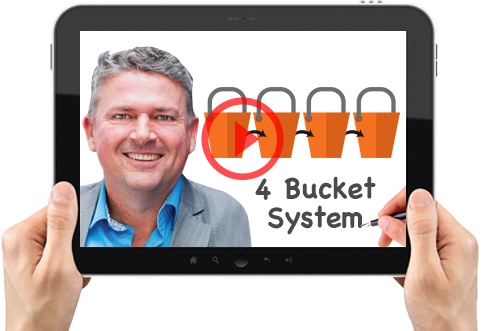 Watch The '4 Bucket System' Now.